Martin Dosh will be returning for the last night of his Turf Club Tuesday residency, The House of Dosh. He has said previously that this night will feature more of his electronic side, something that should delight longtime fans. His last three residency nights have been greeted with near sell-out crowds being treated to some awesome experimental and new jams from the multi-instrumentalist savant. And some still-unannounced friends will be joining him. 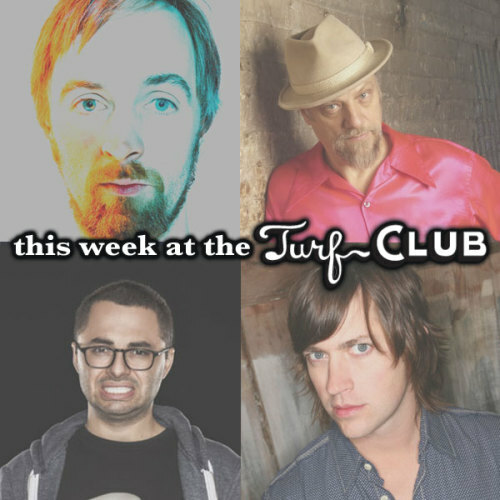 He is no stranger to the Turf Club, and one might say it is his favorite local venue. His work with The Cloak Ox, Andrew Bird, and Ghostband has made huge waves here in the Twin Cities for years now, and is treating his many fans with this great concert series on Tuesdays of this month. Born in Wisconsin, raised in Nashville, Sarah Lou Richards will be bringing her light-hearted twang to the Turf Club stage this Wednesday night. Taking heavy inspiration from her hero, Shania Twain, the singer/songwriter realized not too long ago that she had a message to tell the world. After being raised in Wisconsin, she did not even own her own guitar, changing her trajectory in 2007 after moving to Nashville. She will be releasing her long-awaited new album, The Woman Behind the Curtain - the third part of her trio of albums alluding to The Wizard of Oz. Local singer/songwriter Savannah Smith will be assisting as well, bringing her warm tunes and YouTube fame to the stage. In memory of the late music writer Tom Hallet, the Turf will be hosting a very special night this Thursday. Many longtime readers and friends were shocked with his passing this past August in a brave battle with diabetes. One of his favorite venues, the Turf Club, is the only appropriate place to host this event, and we will be doing so with a slew of friends and artists. Several artists have not been spotted frequenting the venues in the last few years, rather coming up to support Tom Hallet and his legacy in the Twin Cities. Stereo Rules, Ol' Yeller, Peal, Frances Gumm, St. Dominic's Trio, Al Grande Trio, the infamous Martin Devaney, The Mammy Nuns, and Howlin' Andy Hound & The Bloodshot will be paying tribute to the massive legacy left behind by Tommy Gunn. Don't miss this very special night this Thursday at the Turf! Self-described as explosive, yet intimate, Paul Cebar Tomorrow Sound will be taking over the Turf as the weekend begins this Friday. Performing with heavy influences of New Orleans in their soul, funk, and bluesy rhythms. Paul Cebar has been performing and honing his skill throughout the world, including locations such as Africa, the Caribbean, Cuba, and Florida. At his core, he is a master lyricist, being named as an inspiration to numerous songwriters in his field such as Nick Lowe, Bonnie Raitt and John Hiatt. His group, Tomorrow Sound, make a small band feel huge, with their countless talents and instruments they are able to work with with several lifetimes' worth of musicianship. Comedian Joe Mande will be making his Turf Club debut Saturday night. The 31 year old writer, who is based out of New York City is best known for his superb writing for wildly popular TV show Parks and Recreation. His comedic work does not stop at writing, as his talents are not restricted to any one medium. He is a prolific Tweeter and has thousands of devout followers of his website, podcasts, and other collaborations, such as a comedy album with Fabolous, Roby Hibbert and Aziz Ansari. He also holds writing credits for several comedic songs featured across television and the internet, notably for the Nick Kroll's Kroll Show. Be sure not to miss this intimate comedy set, as Joe Mande doesn't have any other Minnesota shows scheduled in his tour. The infamous Rhett Miller of alt-country band Old 97's will be playing the Turf Club this Sunday night in a very short tour he has announced. His unforgettable 2012 album, The Dreamer, was received with high praise from music critics and fans alike, his first self-produced record. A true sign of a talented rock veteran. His brilliant solo career spans five albums, and his work as the frontman of Old 97's complements that of his own quite nicely. As the head of his own label, Maximum Sunshine Records, he has had the opportunity to work with several big name collaborators, such as Jon Brion (Elliot Smith, Aimee Mann, Fiona Apple). Old 97's put on a hell of a show this past June in the Mainroom, so be sure to catch Rhett's solo set in the venerable Turf Club this Sunday night. The famous Turf Club basement, otherwise known as the Clown Lounge, will be hosting another night of American Primitive! This avant-garde-folk genre has captivated Twin Cities audiences for years, and we will be featuring three artists who are especially skilled in their crafts. Matt Sowell, of Philadelphia, being heavily influenced by stylings of John Fahey, is a constantly-evolving guitar player. His rustic guitar tunes match with Americana blues so perfectly. Joining him will be Kyle Fosburgh, the talented young musician who is known for his incredibly polished guitar work, seemingly effortless performances, and beautiful folk-ballads. Rounding out the night will be Nic Garcia, the North Dakota native that can create dark, dream-folk music with ease using his haunting voice and skeletal/minimal guitar work.